Description: It's confirmed! 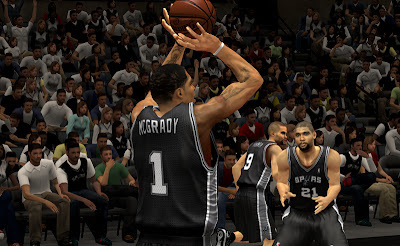 T-Mac will be playing for the San Antonio Spurs for the rest of the 2012–13 season and he will wear jersey #1. This is a custom roster based on April 16, 2013 update from 2K Sports, which basically adds Tracy McGrady to the San Antonio Spurs lineup. I also removed the injuries from all the players so you can adjust the roster and lineups to your liking. Note: I didn't change anything on team lineups so if you want to add Derrick Rose to the current Bulls roster, just go to options, choose manage roster, situationals then swap him with someone else.